I’m just about finished up the last wee cloves of garlic from last year’s harvest. It’s been hanging in my basement since last summer, where it kept very well. As I mentioned a few weeks ago, I have two varieties planted this year, Music and Purple Glazer. 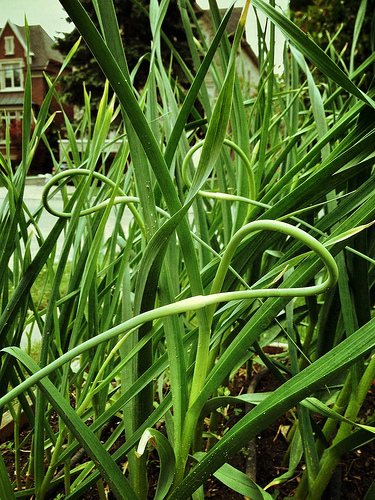 Usually the scapes, the little flower heads that grow out and curl around at the top of the plant, come out around mid June, so they’re a few weeks early this year. I’ve picked most of them; a few of the Purple Glazer haven’t yet curled around, so I’ll give them another day or two and then pick those. 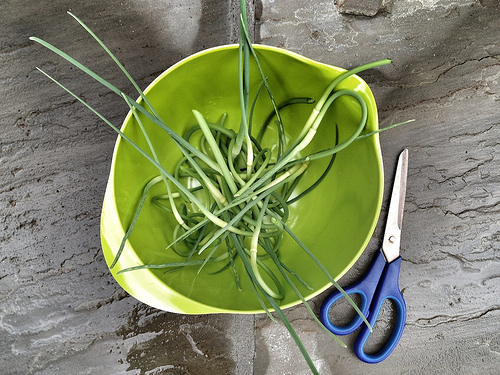 Harvesting the scapes encourages the bulbs to fill out, rather than put energy into forming a flower. The bulbs should be ready to harvest later in July, once the leaves at the base of the plant begin to brown, and about half of the plant has browned and dried out a bit. I’ve sautéed the scapes before and served them simply with butter, but I found the texture of them a bit tough. This year I decided I wanted to try out a pesto, to accentuate the scape’s sweet, garlicky flavour. And let me tell you, a pesto is a perfect way to use these beauties. The texture issue is completely resolved as they are pureed in the blender with some parmesan cheese, nuts and olive oil. Toss this up with some pasta, or as I did, I tossed them with some spinach and feta perogies. You could use this on pizza, crostini or use it as a sandwich spread. Delish! I have some left over and I think tomorrow I’ll make some fresh pasta to enjoy it on. It will keep for about 4 to 5 days in the fridge, or you could freeze it for future use. Put the chopped scapes, nuts, cheese and salt and pepper into a food processor and puree until very finely ground. Drizzle in the olive oil and continue to puree until the mixture is well blended. Use as a sauce on pasta or pizza, as a sandwich spread, on crostini or however you please! 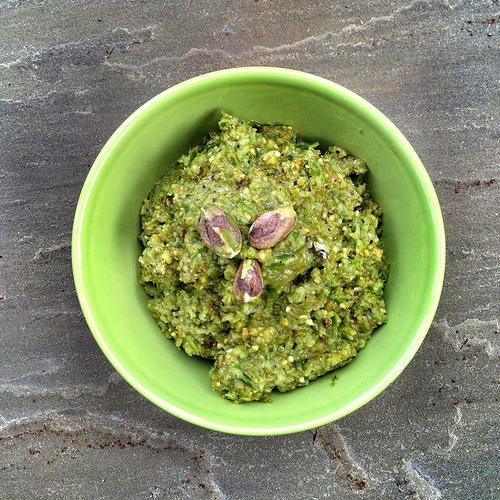 Makes just over 1 cup of pesto. Adapted from Epicurious.com.